Left: Cover of Jess: O! Tricky Cad & Other Jessoterica (2012). Right: Jess, Tricky Cad, Case V (detail), 1958, collage, 13 1/4 x 25”. Courtesy of the Hirshhorn Museum and Sculpture Garden, Smithsonian Institution, Washington, DC. Photo: Lee Stalsworth. Michael Duncan is a critic and curator as well as a corresponding editor for Art in America. He is co-curator of the forthcoming traveling exhibition “An Opening of the Field: Jess, Robert Duncan, and their Circle,” which opens in June 2013 at the Crocker Art Museum in Sacramento, California. Here he discusses his enduring interests in the artist Jess, the poet Robert Duncan, and the impact of the G.I. Bill on the culture of California. He edited Jess: O! 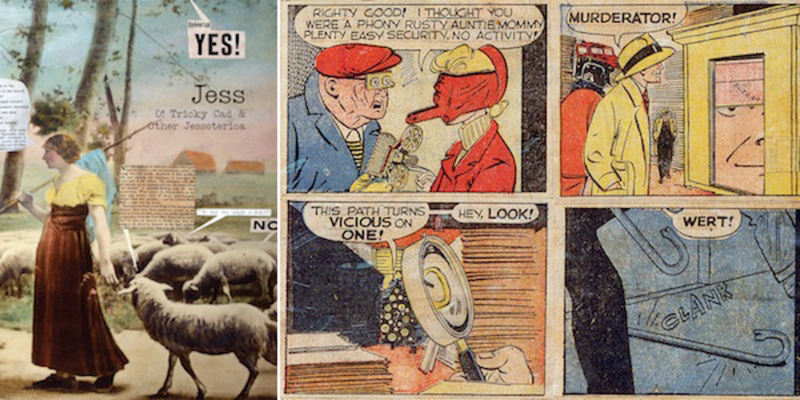 Tricky Cad & Other Jessoterica, a book of Jess’s rarely seen book works, altered comics, word collages, and paste-ups, which was recently published by Siglio Press. I’VE BEEN INTERESTED IN JESS for a long time, and the show I’m now curating is going to have a large selection of his works, as well as pieces by the poet Robert Duncan, his partner. The entire exhibition is designed around Jess and Duncan’s community and the art they had in their house. During my research, I kept coming across collages—which Jess called “paste-ups”––that were gifts to friends or made in very small editions. For instance, I found a wonderful book in the Archives of American Art of collages, poems, photographs, and drawings that Jess and Duncan had made together in a collaboration that was a gift to Patricia Jordan, the wife of the experimental filmmaker and artist Lawrence Jordan. I went to a variety of publishers with this book, hoping to make a facsimile edition, and Lisa Pearson—the fantastic one-woman band of Siglio Press—was very interested. She talked me into expanding the project to include this unseen and lesser-known material that I kept finding, and so quite a few things included in Jess: O! Tricky Cad & Other Jessoterica have never been reproduced anywhere before. Duncan and Jess definitely were one of the most interesting literary/artistic partnerships of the twentieth century, one that has yet to be acknowledged and explored. So much of their experience was centered in their house and the domestic scene that they set up––their home was a true bastion of literature and visual art. They elevated each other in their work, which is something they both talked about in letters to friends. Also in some of Jess’s interviews he gives Duncan all the credit in the world for educating him to a broader expanse of literature and art than he had been aware of before they met. Jess had been drafted out of CalTech in 1943 and worked as a scientist in various atomic labs during the war. When he left science, he also left his last name, and he announced to his father that he was gay—it was all kind of over at that point. He enrolled at the California School for the Arts, which was a really fortuitous thing to happen because it was during its incredible moment when the faculty included Elmer Bischoff, Edward Corbett, David Park, and Hassel Smith. The student body was filled with artists on the G.I. Bill who had seen the world and were open to experimenting with things like Abstract Expressionism. West coast AbEx was such a lively and innovative free-for-all in terms of ideas. For students there was no stigma against figuration, so it was easy for somebody like Jess to explore Ab Ex and allegory at the same time. He felt free to develop openly as a “romantic” artist, something that is totally taboo today but is really at the heart of the kind of proto-postmodernism that both Jess and Duncan explored. They both tracked a different tradition than what we’re taught in the art history books, one open to fantasy and the imagination and steeped in Dante, Blake, Joyce, and Pound. Jess and Duncan were masters of myths. Duncan was an incredible scholar whose interests spanned almost everything, but in particular mythology and the history of culture. They had seven libraries in their house—an old, four-story Victorian in the Mission District in San Francisco. There was a Gertrude and Alice library for modernism, a philosophy library, a French library, and so on. The whole intellectual side of Jess is so apparent when you start pondering the transitions and juxtapositions in the collages. At first glance everything looks totally absurd and illogical, but then the visual logic begins to click. Everything centers on metaphor––metaphor as a kind of a transubstantiation of reality into cultural thought. The associations of various images expand your whole experience of the world. It’s what literature and art is supposed to do. It’s all kind of packed inside Jess’s collages. They’re like night skies with various constellations telling all sorts of stories. They require a kind of intimacy that a book like Jessoterica can foster. The fun thing that you can do with the book is to take off your glasses, hold it up to your nose, and dive into the sky. You enter and get lost in a mythic cultural world that’s beyond the scope of what you could ever have expected.